To us, happiness is defined as the wind in your sails. So kick off your boat shoes, watch the waves and stay a while. Sailing around secluded islands on a chartered yacht as you catch windward waves is an experience coveted by many. And while this utopian adventure might feel like a stretch, it’s the very real and enchanting experience mastered by TradeWinds. 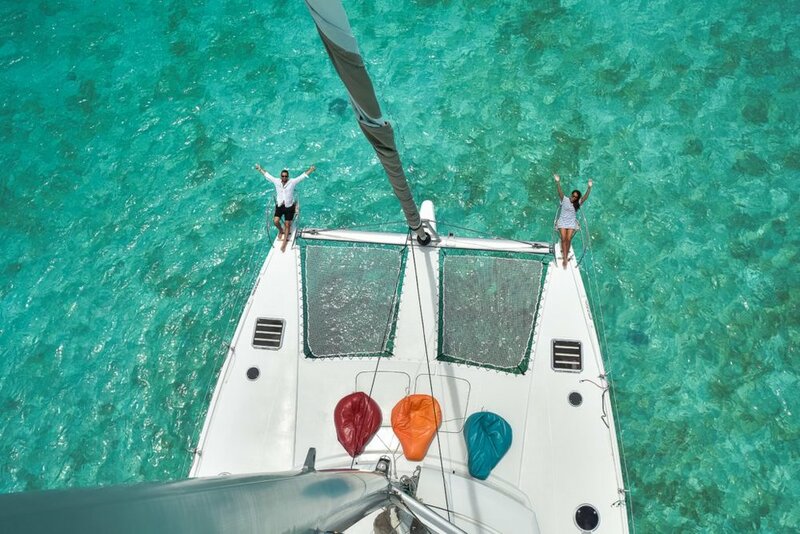 If you’ve ever laid out on a catamaran while cruising 5 nautical miles per hour, all the while taking in the sights and sounds that island life has to offer, then you know what we’re talking about. Between the cooling water splashing against your sun-kissed skin, to the sounds of birds chirping and plant life shimmering beneath the waves, any experience on water is enviable. Any TradeWinds member will tell you that whatever Mother Nature brings to the proverbial table is elevated as soon as you step foot on the yacht. With a system built on points, you can secure cabins to locations including Belize and The Bahamas. Membership lengths vary, as does the pricing structure. Just take note that your airfare and the all-inclusive fee (meals and drinks) are due closer to departure. On the other hand, if you’re just looking to give sailing a try, you can book a one-off berth in advance or last minute. Live like a local, snorkel beneath the waves and watch time stand still as you breathe easy on a bean bag chair. Between the Captain and the First Mate orchestrating every detail systemically, no stone is left unturned. From the moment you wake up, an epicurean feast of local ingredients and mouth-watering baked delicacies are prepared. Breakfasts alternate between hot and cold options including fluffy egg creations and artfully arranged cheese plates. While devouring your delights, the Captain will give the charter a brief, brief – an illustration of where you’ve been and where you’re going. From there, take a hot shower (cabins are outfitted with washrooms and glorious air conditioning), or get lost in the pages of a good book as your bed is made for you below deck. Did we mention that dinner is just as exquisite? From fresh fish to delectable salads and all the fixings, any ordinary meal just won’t do from that point on. The conversations are light, the meals are hearty and the air is balmy – the recipe for happiness. Be prepared for copious amounts of adventure, both on land and at sea. Meet members from all walks of life, and from all corners of the globe. Step into someone’s boat shoes for a week, and listen to their journey. What you will find is that TradeWinds members are entirely passionate about the brand. And to them, it’s so much more than that. It’s a memory that brings them back into the deep blues of Bora Bora, or a balmy night on land as they enjoyed a tremendous aged wine and shared laughs with friends. Members memorize the details; they truly enjoy the Caribbean chicken salad or the rotating menu of Captain’s Cocktails served promptly at 5 pm every day. This membership is a prize and one that they hold dear. Crossing bases off their bucket list is a must, as is sampling an assortment of dishes prepared by locals around the globe. These wave-wanderers live for the moment and intimately understand the sailor’s way of life. Slip off your shoes, let your hair down and cross county lines while gliding across crystal blue waves. Welcome to the TradeWinds life.